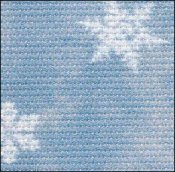 Blue Classic Snowflakes with Silver Shimmer Aida 14  - $74.00 : Yarn Tree, Your wholesale source for cross stitch supplies. Item 4506. Blue Classic Snowflakes with silver shimmer Aida 14. White snowflakes in various sizes scattered across a 14ct 100% cotton fabric. 38"x35". Many winter themed charts would look nice stitched on this fabric. This is an HD fabric. HD means Hand Dyed mottled effect. HD fabrics have been surface treated with digital textile printing using pigment inks to give a hand dyed effect. More consistent in color and pattern than hand dyed. One side is in color; the reverse side is white. Colorfast and lightfast in all but the most vibrant colors, such as orange. May be hand washed in cool water as recommended for needlework.